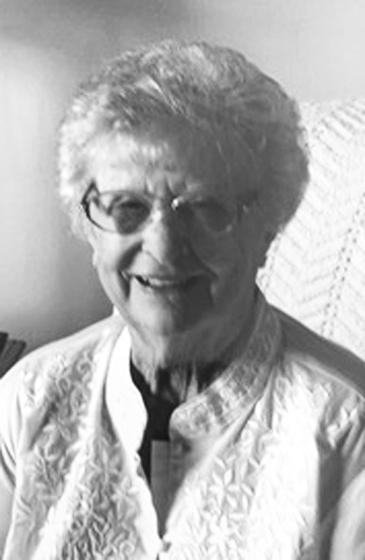 NEGAUNEE, MI – Mary Louise Palomaki, 96, of Negaunee, passed away peacefully late Tuesday evening, January 15, 2019 at the Eastwood Nursing Center in the care of her loving family. Mary was born December 20, 1922 in Milwaukee to Louis and Mary (Franz) Gildner and graduated high school in the Milwaukee area. She was a loving and devoted homemaker to her family. Surviving are her son, Douglas (Kathy) Palomaki of Negaunee; son-in-law, Joe DeChambeau; daughter- in-law, Lynne Palomaki; 7 grandchildren: James (Missie) Palomaki, William (Lisa) Palomaki, Deborah Towslee, Robert DeChambeau, David (Megan) DeChambeau, Marybeth (Sam) Gin and Allison (Irwin Valequez) Palomaki; 8 great-grand- children: Ty, Hunter, Sydney, Samantha, Eli, Annabelle, Theo and Sebastian; a brother-in-law, Donald (Vera) Palomaki; a special niece, Judy Bara; and several nieces and nephews. Memorial services will be held at 12:00 pm on Monday, January 21st at Immanuel Lutheran Church, Negaunee, with Rev. Steven Solberg officiating. Interment will be in Northland Chapel Gardens. The family will greet relatives and friends from 11:00 am until the time of services at 12:00 pm at the church on Monday, and also at a luncheon immediately following services in the church fellowship hall. In lieu of flowers, memorial contributions may be directed in Mary’s memory to the Negaunee Senior Center.